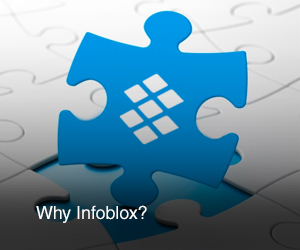 Infoblox DNS Firewall helps you raise security to the next level. It empowers you to proactively protect your network against fast-evolving, elusive malware threats that exploit DNS to communicate with command and control (C&C) servers and botnets. With Infoblox DNS Firewall, you can continuously monitor malware threats in real time based on machine-readable threat intelligence. Working in conjunction with Infoblox DHCP fingerprinting, IPAM, and Identity Mapping, it helps you rapidly pinpoint compromised devices, isolating them and preventing DNS communications with malicious C&C servers and botnets. Automatically disrupt device communications with detrimental Internet destinations by using Infoblox Threat Intelligence Feed of regularly updated malicious destinations (hostnames, domains, IPs). Stop data exfiltration through DNS by using Infoblox Threat Insight, a unique streaming analytics based solution, to identify devices communicating with domains associated with data exfiltration and use a DNS Firewall Response Policy Zone (RPZ) blacklist to block any communication to them. Remediate devices rapidly by having DNS Firewall seamlessly share early indicators of compromise in real time with advanced threat detection, threat intelligence platforms, endpoint security, NAC, and SIEM technologies. Stay safe from malware, even as it continues to evolve. Infoblox DNS Firewall draws on the regularly updated and actionable Infoblox Threat Intelligence Feed to accurately detect the latest malevolent Internet destinations such as hostnames. With Infoblox, you get the only DNS, IPAM, and DHCP (DDI) platform that offers malware protection without requiring endpoint agents. It uniquely enables automated threat response based on our actionable Threat Intelligence Feed and on out-of-the-box integration with cybersecurity ecosystem solutions from FireEye, Cisco, and Carbon Black. Enable you to execute administrator-defined policy action to help disrupt malware communications and reduce exposure to data exfiltration. Updates RPZ policy with observed and verified malicious hostnames and keeps data up-to-date for timely protection. Updates DNS Firewall RPZ policy with domains associated with DNS-based data exfiltration attempts. Cloud-based threat lookup tool provides clear and actionable data: threat severity level, confidence level, active/inactive threat, etc. Provides reporting and analytics on top RPZ hits, attempted device communications to malicious destinations, device details, and user, to help accelerate remediation efforts.